PokerHand.org is a simple and easy-to-use website that lets you create a sharable web page from an online poker hand history. It has several useful features, including the ability to hide your player name, and an area where other players can comment on the hand. Once you have posted a hand, it will remain on the site indefinitely unless you chose to remove it yourself. PokerHand.org was one of the first websites available that allowed you to post poker hand histories in an easy-to-read converted format. 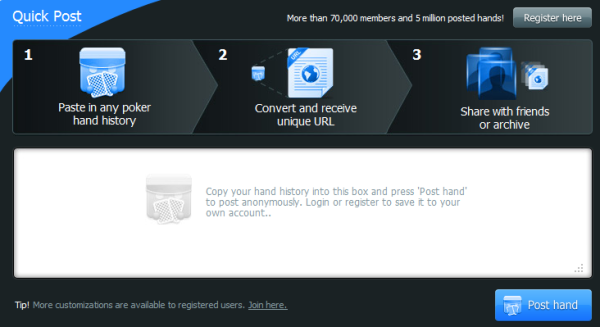 After you fill out a simple registration form, you can begin to post hand histories to share with friends. You simply paste the raw text hand history from the poker site and hit "Submit" and PokerHand.org generates an easy-to-read web page with graphics for all the cards. You can then send this URL to anyone you want to show that hand to. When posting the hand, you also have the option to mask player names or disallow user comments.